Whooping cranes are now well underway on their long 2,500 mile migration back to their nesting grounds. While some of the birds are still at Aransas National Wildlife Refuge on the Texas coast, many are working their way northward to Canada. The birds are departing Aransas Refuge in good condition due to improved habitat conditions there. Soon they will reach Wood Buffalo National Park Canada where they will build their nest and raise their young. 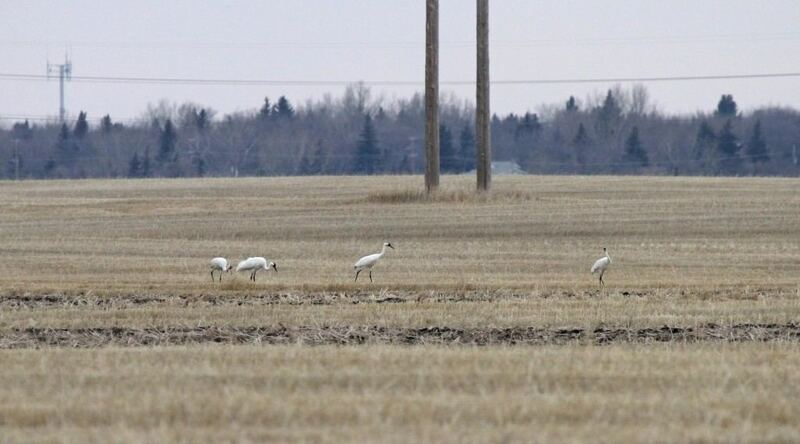 “Friends of the Wild Whoopers (FOTWW) received a report yesterday that four whooping cranes were spotted just outside of Regina, Saskatchewan, Canada. Regina is the capital city of the Canadian province of Saskatchewan and is a stopover spot for the AransasWood Buffalo whooping cranes before reaching Wood Buffalo National Park. 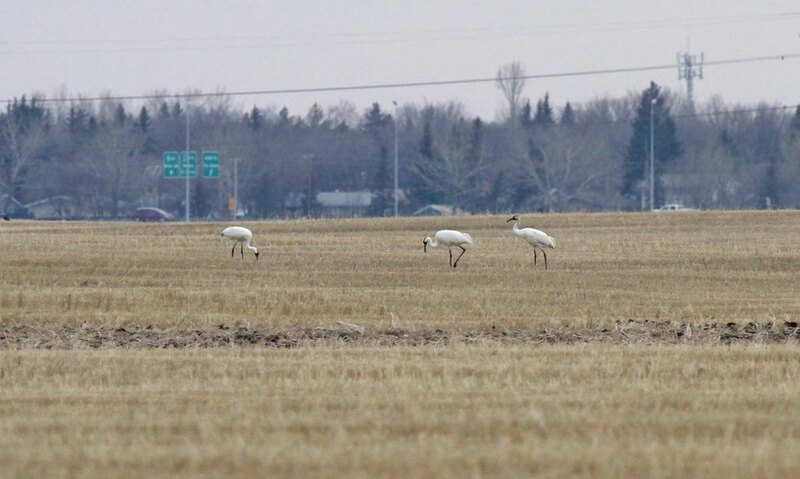 During the past two weeks FOTWW has received a number of reports of whooping crane sightings near Platte River, Nebraska; Cheyenne Bottoms and Quivira Refuge, Kansas; and Aulne, Kansas. The two photos below are proof that they are almost home. Photo by a Saskbird member. FOTWW wishes to thank the Saskbird member for sending us the report and photos, and for Kevin who has kept everyone up to date this winter with his reports and photographs. Hopefully, we’ll have more reports and photographs, of the wild ones throughout the summer. Pingback: Aransas/Wood Buffalo flock of whooping cranes is now on their way to their Canadian nesting grounds.